Optimized parameters produce weld-ready cuts; notice the angle of the cut lines, which indicates proper travel speed. Investing in new equipment always comes down to analyzing budget vs. benefits. 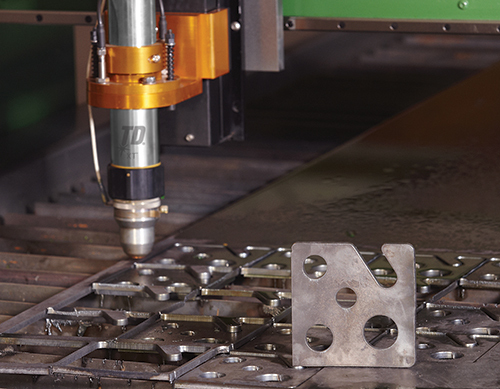 This tutorial will help readers looking to purchase their first automated plasma-arc cutting (PAC) system, as well as those considering an upgrade to more productive technology. We especially intend this article for operations cutting mild and stainless steel and aluminum sheet and plate, from gauge thickness to 1⁄4 in., and who would be well suited with a 5- by 10-ft. cutting table, appropriate for cutting 4- by 8-ft. plate. Automated plasma systems make sense when fabricators need to cut the same shape repeatedly. Automation makes sense for fabricators that repeatedly make the same cuts, have a high degree of rework with manual operations, struggle with poor fitup, need weld-ready parts, and face labor shortages or labor-cost issues. Addressing one or more of these issues through automation improves productivity and ultimately lowers per-part cost. Automation also can decrease order lead times, and an inhouse cutting system enables fabricators to cut parts at their own convenience rather than based on the schedule of a metal service center. 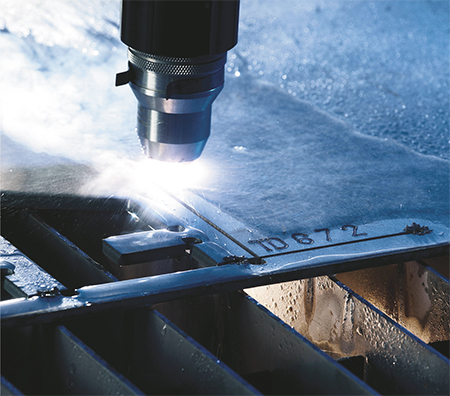 Many fabricators evaluating automated cutting systems also may evaluate waterjet and laser technology. Both offer tighter tolerances and better cut quality than plasma, but plasma cuts faster. And, comparatively speaking, plasma has the lowest initial cost, summarized at the end of this article. The plasma industry generally divides cutting technology into two categories: standard definition and high precision. Standard-definition systems suit those who plan to cut only a few hours per day and a few days per week, or when tolerances of ±0.02-0.03 in. are acceptable. Fabricators that anticipate a cutting-table utilization rate of at least 50 percent or that need a cut accuracy of ±0.01-0.05 in. should select a high-precision system (see sidebar, “Understanding Cut Quality”). Standard plasma systems, sometimes called air-plasma systems, feature an air-cooled torch and cut with a single gas, typically air or nitrogen. They use the same cutting technology as manual plasma systems but feature an automation interface and the ability to accept signals from a controller, such as “start,” “stop” and “OK to move.” Several systems enable fabricators to switch easily between a 180-deg. mechanized torch and a conventional manual torch. An inverter-based air-plasma system with an output in the 120-A category (120 A at 80-percent-duty cycle) can weigh less than 65 lb. and have the flexibility to use single- or three-phase power and multiple primary voltages. Such a system enables fabricators to use a single system for automated or manual cutting, shop or field work, which may further justify the investment. 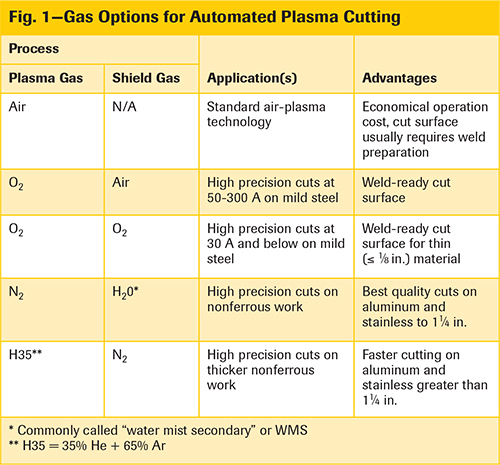 High-precision systems, which use a water-cooled torch, employ one gas for cutting (the plasma gas) and a separate shield gas to prevent or minimize the formation of nitrides on the cut surface (Fig. 1). The majority of the technology advances reside inside the PAC torch (managing a 35,000 F plasma arc literally is rocket science). Further, torch consumables are the primary drivers of plasma quality and operating costs. As the plasma tip and electrode wear, cut width gradually increases; arc starts/stops and arc stability become less than ideal. Eventually, cut tolerance or system performance becomes unacceptable and users change consumables. Standard-definition consumables cost less ($20 for a tip and electrode vs. $45), but high-precision plasma consumables last at least five to 10 times longer. A shop with low table utilization will be less concerned about the cost of consumables and more concerned about the price of the power supply. Conversely, an operation with a high arc-on time will want to maintain productivity at the highest possible level. Such a shop won’t want the rework or other issues related to loose tolerances, while seeking to minimize downtime related to changing consumables, as well as unplanned downtime. Only a high-precision system enables such performance. The quality of torch, torch lifter and height control directly affect cut precision and consumable life. As a side note, consider torch designs with quick-change torch cartridges that twist off and on in less than 1 min. Fabricators can minimize downtime by keeping a spare cartridge pre-loaded with fresh consumables. Because consumable costs play such an important role, plasma-system suppliers can provide a cost-per-cut or cost-per-part calculator that enables the fabricator to compare purchase price, operating costs and return-on-investment for a specific application. As a good starting point for balancing cut quality and speed, consider that almost every system manufacturer recommends a cutting output of 10 A per 1 mm of material thickness. Thus, cutting 6-mm-thick material requires setting an output of 60 A, ±10 A; a 100-A, 100-percent-duty system provides more than sufficient capabilities for optimized productivity. Note that more power is not necessarily better. An excessive current setting creates top-edge rounding. The cut also will have a larger bevel and excess dross, both of which will require post-cut grinding or machining. The added labor cost and increased cycle time negate any speed advantage. When evaluating cut quality, consider the characteristics below. Note: Suppliers of PAC machines can provide cut-quality samples, including estimates of cutting time and estimated cut-cost per part. Cut surface. A quality cut means that the part is ready for the next fabrication step. Characteristics include a smooth surface free from dross and nitride contamination. Top-edge rounding, caused by the heat of the plasma arc at the top surface of the cut. Proper torch-height control minimizes top-edge rounding. Top spatter. Cutting too quickly or excessive torch height can cause top spatter (typically simple to remove). Bottom dross. Easy-to-remove dross indicates cutting too slowly; difficult-to-remove dross indicates cutting too quickly. Kerf width relates to tip orifice size, current setting and torch height. Cut-surface bevel angle. High-precision processes produce a bevel angle of 0 to 3 deg. (ISO 9013 Range 3 or better), while conventional plasma will produce larger bevel angles. Proper torch-height control helps to minimize bevel angle, as well as kerf width and top-edge rounding. Nitride contamination. When cutting carbon steel with air as the plasma gas, some of the nitrogen becomes absorbed into the cut surface, which requires grinding before welding to eliminate porosity and the risk of nitrides at the grain boundary. With the balance of power, speed and quality in mind, users should expect a maximum cutting speed of about 100 in./min. from a high-precision PAC machine. If cut quality is less of an issue or cuts are on long, straight edges, cutting speeds can increase to 150 in./min. or more. Conversely, to maintain cut quality on corners, holes and intricate parts, cutting speed will be slower. A good-quality cutting table can hold tighter tolerances than the plasma process itself. However, many believe that purchasing a high-precision plasma power supply lets fabricators skimp on other components. That’s like buying a Corvette and then trying to save a buck with discount tires. A fully integrated system includes the plasma power source, CNC controller, torch-height control, torch lifter and its associated motors and drives, and an automatic gas-control console. In an automated plasma system, these components work in perfect harmony to control cutting amperage, torch height, speed and gas pressure. While CNCs for integrated systems and their software add significant cost, they also provide fast payback. For example, a CNC automatically can set and control parameters for “best cut quality” or “fastest cut,” after the operator selects the material type and thickness and cutting-gas combination. Greater productivity and reduced errors. Operators become productive after just hours of training, instead of weeks; one less manually programmed variable is one less item that can go wrong. Hole/process optimization technology. After loading a cutting program (or even just a DXF file into a controller from a flash drive), the CNC will examine the file and determine which parameters need to be optimized. Then the controller quickly can recalculate the optimum parameters and cut paths. Without any operator or programmer input, fabricators can obtain bolt-ready holes and better part fit, and eliminate hours of post-cut grinding. Similar technologies exist for optimizing cutting order and pierce methods, as well as locations for complicated nests. Automatic nesting tools. For fabricators lacking a separate engineering department, these tools prove invaluable for reducing plate waste and cycle time. Bridge tools typically reduce the number of pierces in a cutting program. They automatically assign cut segments between parts to reduce the number of pierces and cycle time. Cost savings as great as 40 percent are possible. Fabricators determined to minimize their initial expense could forgo a CNC and settle for a manual gas console. However, never skimp on a height controller and torch lifter. As with arc welding, voltage is directly proportional to arc length, or torch height. If torch height varies, cut quality will vary from part to part and even within a single part. At a minimum, use a controller with functions for pierce-height control, pierce delay and pierce retract. These functions extend consumable life by reducing electrode wear during arc starts and stops, and by minimizing the amount of molten metal that splashes up during arc start. Fabricators can use high-precision systems for plasma marking without changing consumables.